Why Not Commission A Pet Portrait ? Pet portrait of your beloved dog or cat? I was thrilled to be asked in December to create a pet portrait for a lovely couple who adore their beloved dog called Toby. Sara suggested that I create the pet portrait in watercolour and was keen for me to have quite a free rein as to the outcome. Of course painting a pet portrait for someone is a very personal experience and involves getting to 'know' the personality of the pet in order to achieve the best result - so the more information that you can give towards your personal pet portrait the better. Today, I just thought I'd share a little of the process and to give you an opportunity to commission a pet portrait for your family pet. By the way, the lovely Mary Catherine Starr paints a wonderful pet portrait (and other artwork). Firstly I was sent lots (20+) of photos (yay!) of Toby via a Facebook Album. 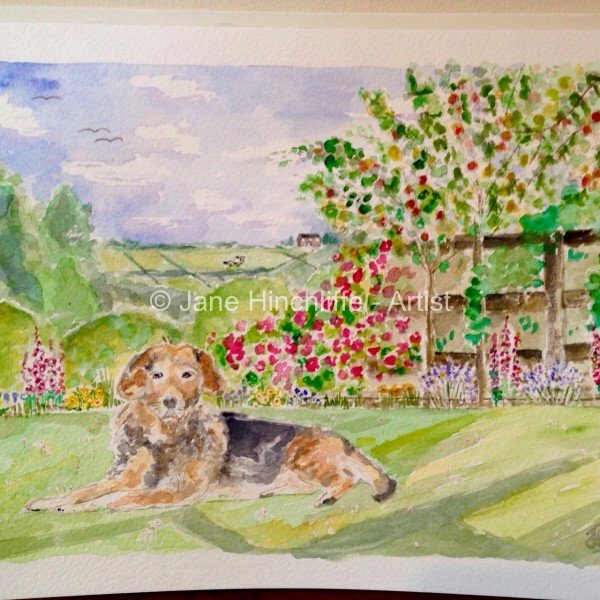 There were photos of Toby in various lying and seated positions, different settings like the garden (see above painting), looking out of the window resting on his favourite seat, outside whilst being walked, lying on a bed - all snug and cosy etc. Sara was happy for me to choose the photo/photos I liked best and to go from there. From the photos, I jiggled things around a little - for instance, the photo of the garden, showed Toby's eyes nearly shut and I thought it would be lovely to see his eyes wide open. So, I took reference from another photo of his eyes and markings in closer detail and translated that into the painting. My other suggestion was to decrease the size of the hedges a little so that more of the Dales' landscape could be seen in the background - Sara liked this idea. As you can see above, I sketched out my chosen composition and checked with Sara if there were any additions she would like incorporated into the painting. My suggestions were a little barn on the skyline, adding some flowers of her choice, daisies growing in the grass and Sara's suggestion of adding a few sheep in one of the distant fields. After getting the okay on the preliminary sketch, I started to lay down some light colour washes, making sure that the areas I wanted to keep white were blocked out (see the small green blobs). Next, were additional colour washes, more contrast and some detail - everything's starting to come together now. I had asked Sara what flowers she would particularly like in the garden and Sara chose foxgloves, lavender, roses and yellow primroses - I managed to include them all. Of course, I saved the best to last and began building up washes, contrast etc for Toby. Let me tell you, pretty soon I was falling in love with this little guy - what a cutey! jane_hinchliffe @ btinternet.com (no gaps when typed). Remember, this is a painting of your pet in a setting, whether that be the garden, in the woods, sleeping on a chair etc and as a result of this, I do need photos to work from. The watercolour paper used is of a bright white colour. Daler & Rowney Mould Made Watercolour paper NOT (Cold Pressed) 140lb (300 gsm) height 12"/30.5cm x width 9"/23cm image has a white border around it for ease of framing. The paper is of a standard size, so you should not have any problems purchasing a mount/frame to fit your pet portrait from most department stores.